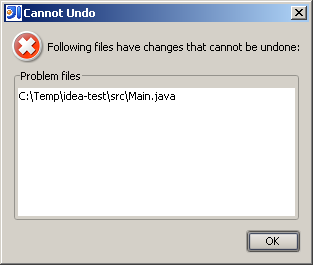 My problem is that when I press Ctrl+Z, IDEA gives an error message "Cannot Undo: Following files have changes that cannot be undone". How can I make my plugin support undo? As far as I know, IDEA cannot undo any external changes. The most promising approach seems to be to make the change to some temporary file, load its content and put it into the actual file with IDEA's Document API to make it aware of the change. Although that's probably not very efficient. For details, see the net.orfjackal.extformatter.plugin.ExternalizedCodeStyleManager class in my plugin[/url].